I decided an article on Cory Doctorow would be my first post for this site, as Cory’s book licensing model is actually the inspiration for creating it. All his books are available for free download from his site, in various ebook formats for different readers, licensed under a Creative Commons, Non-Commercial, No-Deriv’s licensing model. I was a bit thrown back by this when I first encountered his site as eBooks aren’t generally found for free unless they are in the public domain… or complete garbage. So an author releasing books which are Top 50 sellers on Amazon at no cost was quite a surprise to me. So why did that lead to the creation of this site? … If there are authors like Cory offering his books online and I didn’t realize it… how much other free content am I potentially missing? The free downloads of the books are ad-supported, but I found the ads to be not too intrusive. There is a little blurb at the start or the end of each chapter with some advertising of various bookstores. The ad is italicized, differentiating it from the actual content of the book, so it is quite easy to glaze over while you read. 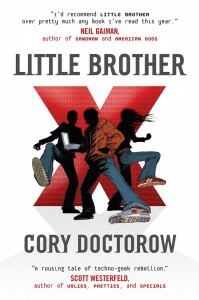 The first book I read was Little Brother, and I found it be a quite enjoyable Novel… at least for nerd like myself. The book revolves around a small group of young hackers who find themselves in the wrong place at the wrong time, and end up being abducted by Homeland Security after a terrorist attack takes place in a future set San Francisco. The main character is held prisoner and tortured for suspicion of terrorism, simply because he tries to exercise the rights he thought he had. But those rights are gone, at least according to Homeland Security, for the safety of the people. This book especially rings true as I am writing this post shortly after the bomb attack at the Chicago Marathon. Attacks like this occur and the government make changes to protect us from these incidents, but is the cost of this protection eventually going to come at the expense of our freedom? One note on this book I want to make… The first few chapters were a bit hard for me to get through. The author comes off a bit like an adult trying desperately to prove his “cred” in the hacker / underground internet scene. You will encounter paragraph after paragraph of pointless references to stuff that does little to actually further the story. Luckily this does not continue throughout the whole book, and once you get out of the first few chapters of him explaining that “w1n5t0n” isn’t pronounced w-one-n-five-t-zero-n its pretty smooth sailing. 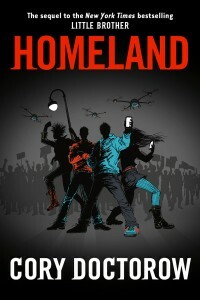 Homeland is the 2nd book in the Little Brother series. Once again, our young hacker heroes find themselves in trouble with Homeland security as they fight for the rights and freedoms of their country. The 2nd book has some obvious inspiration from WikiLeaks and is focused around Marcus coming across a data file with hundreds of thousands of documents from homeland security. As they go through the documents they uncover all sorts of cover ups and conspiracy’s and eventually come across the mother of them all. But are they going to release these documents to the public without a fight from Homeland security?? Of course not! This book also suffers a bit through what I can only call nerd cred validation but it’s not as bad as in the first novel… certainly not enough to detract from my enjoyment of the book. The next book on my suggested read list is Pirate Cinema. This book follows a similar tone to Little Brother and Homeland in that it takes place in the not so distant future and paints a chilling picture of where we are headed with the way anti-copyright laws have been progressing in recent years. This book follows a young Trent McCauley who is a hobbyist video editor that creates new film content by splicing, joining and dubbing excerpts from other popular film. In order to support his hobby however, he downloads copies of movies to get the pieces he needs. Unfortunately for Trent, he gets caught, and in this future setting the penalties for piracy are quite stiff. His entire household has it’s internet connection shut down for a year which causes a chain reaction of terrible events in the family including his father losing work and his sister crashing and burning in her studies. Trent can’t handle the guilt he feels for what he’s done to his family and runs away to London where we encounters an entirely new life style. Doctorow, likely inspired by “Freegan” movement, has Trent living a life squatting in houses and eating out of dumpsters while him and his friends put on outlandish film events and make plans to fight the copyright laws that got him in this place. 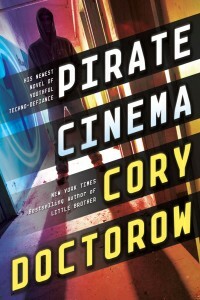 Pirate Cinema is a thrilling read and Cory has received prestigious awards for this work.